I had picked up Gitanjali Gems on 29Apr’10 and have been holding it since then. The point of my purchase is shown as the green star on the chart alongside. The timing looks awesome but I don’t really care – I’ve gone through the motions quite a few number of times by now. What I am really focused on and trying to discover is a personal method that helps me to know the right time to sell. If I can reach that stage of ‘enlightenment’ by my next birthday, I would have really matured as an investor – in my opinion. Coming back to Gitanjali Gems, it has been an awesome climb, right? In all of 6 months! So is it time to say bye to bling bling? I don’t think so. Why? I like it! Reason enough? It better be! Take a look at its website and you’d be forgiven to think that u’d landed at some Bollywood portal given that Neha Dhupia, Salman Khan, Katrina Kaif and Kareena Kapoor glitter through in huge 4” by 8.5″ sized banner frames! At least in my browser window. As if personifying Nakshatra, D’damas, Gili and Asmi. And that’s the point – the company has been so successful in transforming these product names into integrated brands with massive recall. There’s Sangini and Vivaaha as well. Shahrukh Khan is also hidden somewhere in the inner pages of the website – try that ‘treasure hunt’ search if you have nothing else to do and are fully invested in this company. It spent INR 25 crores servicing its debt in 1Q11 which is approximately 2.5% of what it sold. In that sense, the big question mark is the retail foray. Why get into making malls and infrastructure when diamonds are forever? Will they add more leverage to their balance sheet? My hunch is that the Italian Job and/or the SEZ fling will increase the interest costs for the company – let’s see. I think I will hold on given that this position of mine has perked up 144% in double quick time, so even if it corrects I’ll be cool. 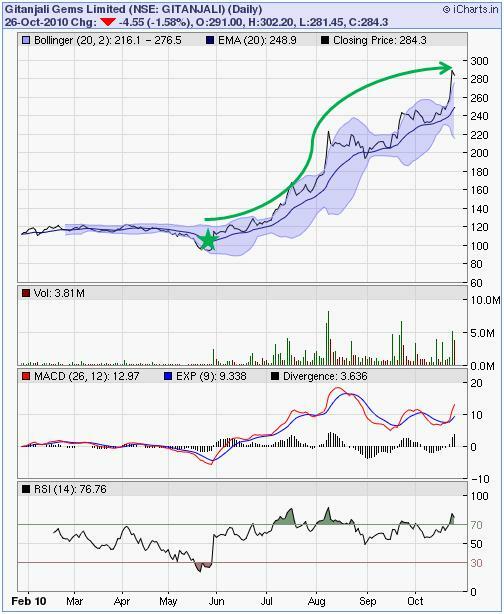 The technicals are shooting up full steam ahead and the share has seen a near parabolic climb recently. So some steam will definitely get let out. My investment logic was never based on such crappy observations that Indians are getting urbanized and therefore they’ll shun traditional gold ornaments and stud themselves with diamonds. The market leader in branded diamond jewellery was available at a market cap of INR 980 crores only. So while it was not some Grahamian deep discount discovery but there indeed was lot of money on the table to pick up. Now, however, it looks like a traditional and boring growth story. But even a slow and steady rise of 15% per annum will make it a 3 bagger for me in 18 months or so! The anticipated deluge of US hot money notwithstanding. If that target is reached much sooner, then I’ll jump out. But wait. Is this not a retail stock? And don’t retail companies, especially ones with a glittering track record and market leaders in their segment get high multiples? If we assume an EPS of 30 for close of next financial year, it’s forward P/E comes to 9.5 only. Plebian, male names sell at such high forward P/Es. When will India and Indians give equal opportunity to females, I wonder. Look at the table below to see what I mean. Gitanjali means an offering/anthology of songs. Would it have made any difference to its valuation if Mehul Choksi would have called his company Upanishad Jewels? ( = anthology of teachings from Vedic Hinduism) Or maybe his choosing the name Gitanjali might have been quite a prescient flash then? I don’t know what these boring boys are doing with jewels and diamonds – let’s leave them for pretty girls like Gitanjali and focus on making money instead. And please do not ask me why I did not buy this stock when it was INR 34 (Mar 2009) if I am really as smart as I pretend to be.